I liked this book. I could’ve loved it, but it was just too long-winded for me. I honestly didn’t need to know what everyone was wearing or what kinds of critters they saw out their window. I enjoyed the dialogue, the eccentric characters, and the main plot line. The Prayers of Agnes Sparrow seems to require analysis. It’s not just a book to enjoy and forget. Magnin makes her points with repetition and quirkiness – hard to miss! Magnin deliberately shows the reader over and over how smelly and dirty and gross Agnes’ body is… not as a comment on her size, but as a comment on the exhausting caretaking job her sister Griselda has and the mental and physical imprisonment Agnes suffers. I also don’t think it’s an accident that the cat brings dead animals to the former funeral home, nor that the new cop in town is busy chasing after a homeless dog the whole time. I don’t want to ruin the story, but Magnin uses these vignettes to illustrate bigger points – like the nearness of death, the futility of the hunt unless you know what you’re hunting for, and that THINGS AREN’T ALWAYS WHAT THEY SEEM. We need to look under the folds, people. Peek beyond the masks, decode the facades. My biggest takeaway from this book is the sin of man creating his own gods in the pursuit of the one God. 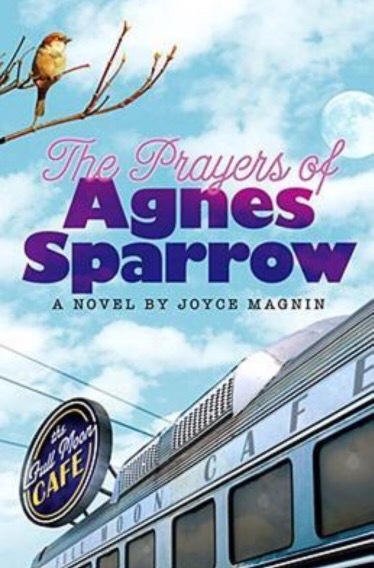 In The Prayers of Agnes Sparrow, the people made Agnes their god. They made PRAYING their god. They made food their god. Some of them even made preaching against Agnes their god. It was all in the name of fellowship and religious advancement, but none of it put their eyes on God. It’s no wonder the sign and statue came to the fate they did. Ba’al, the golden calf, and the Tower of Babel, anyone? !